Tom Kitchin’s fourth Edinburgh wean, the youngest of the bunch, recently opened in Bruntsfield and let me say straight off the bat, it’s a bloody delight. I’ve been to three of his restaurants in Edinburgh now and I reckon this one’s going to be a regular haunt. Scran & Scallie is much more relaxed dining (read: children roaming free), The Kitchin is a proper special treat (read: I spent over £350 on Jamie’s birthday tea there once…) but Southside Scran is a wonderful ‘in-between’ with a French bistro vibe. I’ve not made it to Castle Terrace yet but Tam, if you’re reading this, yes absolutely we’d love to come for dinner on you – how very generous. We ordered the sharing rotisserie whole roast chicken and selected an array of sides, going for the French bean salad, beets, orange & feta, macaroni cheese and fondant potatoes with confit garlic & spring onions. We were of course starving, as per usual, and when the server said it would be about 40 minutes because they roast each one individually on the open grill (which you can see in the restaurant!) she immediately met the panic on our faces and cries of ‘bread? !’ with a promise of ‘bread and bits’. The warm bread arrived with a little pot of chicken pâté topped with a calvados jelly, some deliciously soft butter on a tiny wooden board and a pot of the freshest, crunchiest little cornichons. The only small irk I have with the whole place is that they don’t give side plates for the bread and although its casual dining, there were crumbs everywhere on the table which I kept finding myself sweeping into little piles to tidy up. The chicken arrived much quicker than we expected and by this point the wine had hit my stomach. I don’t think we spoke much until our cutlery went down. The chicken was so moist, in the most delicious herby, rich gravy. The bunch of herbs in the dish did feel a little ‘cleansing bad spirits’ but whatever, it tasted great. The chicken and four sides was a perfect amount for the three of us for lunch, if you had it for dinner I reckon you’d also have room for starters and puddings. We finished up our meal with some cocktails. Rachael had a ‘Mint Condition’, white chocolate Hendrick’s Gin, Branca Menta, Crème de Cacao, cream & sweet chestnut. Nicole had a ‘Cigar Old Fashioned’ with Smoked Monkey Shoulder Whisky, honeycomb, Angostura Bitters & orange bitters and I went for the ‘Southside’, Tanqueray No. Ten gin, Fino sherry, lemon, lime, mint gomme, fresh mint & cucumber foam. It was a delightfully bright green so I’m definitely pretending it was some kind of health-cocktail. Our bill came to a ridiculously good £96, which is only £32/head before tip, for wine, lunch and cocktails. Add in attentive but casual service, delicious bread that kept being refilled and cocktails that didn’t take 45 years to come, I’d say that’s a bloody bargain. Since we spent my birthday/hogmanay in the house, Jamie and I decided that we’d book Southside Scran for a late birthday tea on the 1st of January, his treat. I’ve never left the house on the 1st, never mind got dressed up for a nice dinner, but it was a wonderful way to start the year. Having been before, I knew what to expect in terms of service etc, but after being seated near the door/next to the bar, I had to do the thing I used to hate when I was a server. I asked if we could move. I held my breath but needn’t have bothered, it was not a problem and we found ourselves whisked off into a cosy, corner table. We ordered a couple of glasses of wine and I let Jamie pick for me since he’s more of an expert. My general wine opinion is; ‘is it wet? is it cold? is it ABC?’ The ABC rule for those unaware, is something my mother taught me early on in life – ‘anything but chardonnay’. I had a glass of the Loire Valley Sancerre and Jamie went for the Picpoul du Pinet. We wired into the tasty bread and ‘surprises’ as our lovely waiter described them. I didn’t have the heart to say I’d been before so I did a great fake ‘oooh’ when they arrived. He was delighted, give me an Oscar. We passed on starters but next time I pop in (Mum & Dad, fancy it?) I definitely want to try the game pithivier, mostly because I watched someone make one on Masterchef the other day and it looked tasty. I ordered the pork belly with apple sauce and Jamie went for the cajun spiced North Sea monkfish tail. We shared a French bean salad, some fondant potatoes (so good) and the pumpkin & Jerusalem artichoke. We made a deal to squeeze in a shared pudding, but when the menu arrived and of course after I’d insta-stalked the desserts, we ended up with one each. I had the chocolate tart with milk ice cream and Jamie had the signature rotisserie pineapple with rum sauce. For a man who loves booze, this was his ideal pud. A thick slice of hot pineapple with a sticky, strong rum sauce and a dollop of vanilla ice cream – oooh it’d warm a Tory. My chocolate tart was a light texture and dark-chocolately enough to let me eat almost the whole thing without it being sickly, but not too dark that you’re drawing your cheeks with each bit. Milk ice cream was a new one to me but it was really light and a perfect pal to the chocolate. Visit their website here to book online and see the full menu. I am thirty. 30. 30 years old. I orbited my last year of my twenties and on the 31st of December, specifically at 5.17pm, I turned 30. I think I’m supposed to be more upset than I am. Don’t get me wrong, I’m not exactly thrilled that I’ve got to this age and I’m still dog-less and not the editor of Vogue, but 13 year old me had big dreams with little to no motivation so here we are. 30 years old, living in Edinburgh with my boyfriend, in a beautiful rented flat we can juuuust afford. I can drive, I have a little white (/muddy) Corsa, in which I zip up and down the motorway each day to and from Stirling for work. I’m in year 5 at the Union, now the Communications, Marketing & Events Coordinator and yes that is three different jobs in one because I am a fantastic multi-tasker. And… well other than being a friend, a daughter, a sister and a granddaughter – I have nothing else to really say about me. I stopped blogging in 2016 after anxiety swept in and my current hobbies include our new Xbox and obsessing over Mrs Hinch on Instagram. That’s where this post has come in – I’m embarrassed about it. I’ve been job hunting and I can present a cracking CV with loads of great experience and hard bloody work but when they ask me what my hobbies are or what I like to do in my spare time, I’m like ‘uh, I love to eat’. I’ve got such guilt about not being a more involved person in my own life. I spent the past couple of years getting myself together and now I’ve plateaued. In a recent interview, they asked me why I wanted to be an Events Manager and not a Content Creator since I wrote blogs, ran social media accounts/websites and had an English degree. I said it was because that side of my experience didn’t excite me or challenge me the way running events does, and that’s pretty sad. Or is it big-headed? Either way, I feel like I should be embracing all the areas of my life that both ignite my fire and play to my strengths. I had a small epiphany about my life whilst on the loo at a restaurant last night, just a pee folks – it was a quick epiphany. An epip, if you will, and it was that I should start writing again and I should do a post about where I was. I spent years writing bar & restaurant reviews and I do miss it! I miss the thrill of PR invites and going to new openings. Before, I was writing what I wanted to say but I was so conscious of what people might think of it. Now, I’m writing because I enjoy it. I like to sit and lose myself in a quiet room, usually at an awkward time like just before I’m supposed to put something in the oven or after the heating has clicked off so I end up frozen. It’s quite therapeutic. The other difference is that Jamie and I are about to embark on a new journey we call ‘not putting butter in everything’. I am a bridesmaid at my dear, oldest pal’s wedding in August and I want to look and feel my best – mostly so she doesn’t edit me out of the photos. So we’re getting ripped. Heathy, sensible food, big walks, joining a new gym, taking on some new healthy habits etc etc. This doesn’t mean I’ll only be posting about places that serve quinoa, but some posts might be about healthy dinners that Jamie has made me or a word-dump of how it’s going so far. Oh, if you’re reading this and you’ve not seen the # we have for the incredible food Jamie makes us, it’s here – #jamiecooksforlauren and it’s probably about to get a lot more green. 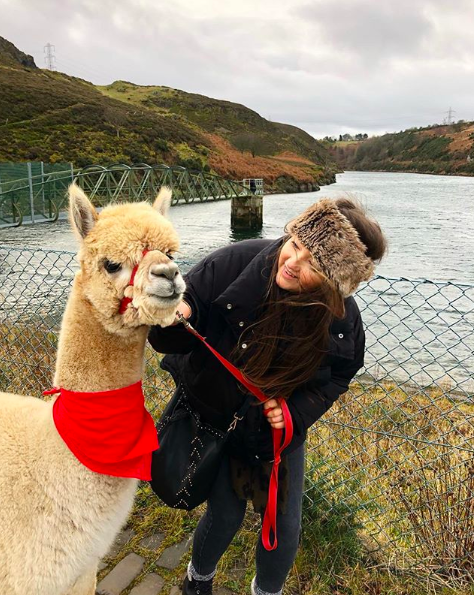 So aye, basically I’m back and I hope that’s ok. First post is either going to be about the alpacas we walked for my birthday or Tom Kitchin’s new place…what a bloody fabulous start to 2019. HWFG.